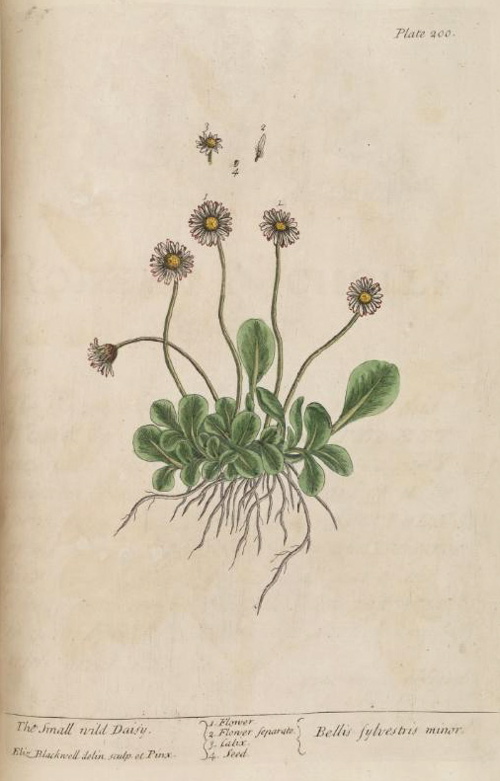 Hortus Camdenensis | Bellis perennis L.
Paxton's Dictionary lists the varieties fistulosa, red; hortensis, red; and prolifera, striped. The Floricultural Cabinet [FC p.1/1851] and Flore des Serres [FS f.584/1850] figure a number of new varieties, all double and large flowered, pure white, deep pink, rose pink with a pale centre, pale rose pink with a deeper centre, pale rose speckled with deeper pink, and variegated deep pink and white. Once used to treat wounds and grown in gardens for this purpose. [HB] It has found wider medicinal uses, for treatment of gout, rheumatism, ague, migraine and colds. Extracts mixed with milk were also used to stunt the growth of children and dogs, and keep them small. [McLeod]. ‘The Small Wild Daisy. Bellis sylvestris minor. The stalks grow about four inches high, the leaves are a light green, the flowers white set about a yellow thrum & and sometimes red round ye edges & red underneath. It grows in fields & meadows flowering in March, April and May. This accounted a traumatic & vulnerary plant, being used in wound drinks; the leaves are esteemed good to dissolve congealed and coagulated blood, help ye pleurisy and peripneumonia. Some commend a decoction given inwardly and a cataplasm of ye leaves applied outwardly as extraordinary remedies in the King’s Evil.’ [Blackwell pl.200/1737]. Listed in all published catalogues [H.26/1843]. Possibly grown as a medicinal herb but a very popular garden flower in England. 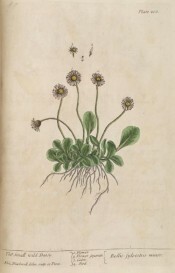 More details about Bellis perennis L.